For Furniture & Large Items Photos & Results (Apr. 23rd Auction), Click Here. For Miscellanous Items Photos & Results (Apr. 23rd Auction), Click Here. 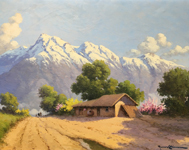 For Oil Paintings & Artwork Photos & Results (Apr. 23rd Auction), Click Here. For Jewelry Photos & Results (Apr. 23rd Auction), Click Here. For Wide-Angle Photos of All Items in the Past April 23rd Estates & Consignments Auction, Click Here. To see the YouTube Virtual Video Tour of Most of the Items in the Past April 23rd Antiques, Vintage & Mid-Century Auction, Click Here. 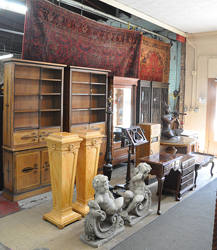 When will the Photos, Video & Catalogue be Posted for the Upcoming May 7th Antiques, Vintage & Mid-Century Auction? The YouTube Virtual Video Tour will be Posted on Sunday Morning, May the 5th...Wide-Angle Photos of All Items in the Sale will be Posted on Sunday Evening, May the 5th...Close-Up Photos of the Better Individual Items will be Posted on Late Monday Evening, May the 6th, and will be Posted all the way Up Until Sale Time...And, the Complete Auction Catalogue will be Posted on Late Monday Evening, May the 6th...Be Sure to Check Back to this Site Later for the Video, Photos and Catalogue for this Upcoming Estates & Consignments Auction...! Or, Check out our Facebook Page, where Photos are Usually Posted a Bit Earlier...! 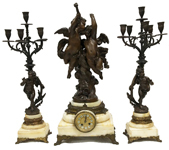 Click Here to go back to the Direct Auction Galleries Main Home Page.